In the last few days, I've felt a new chill in the air that seems to crop up around Christmas time and stick around until the end of January. Baltimore is mild in terms of winter weather, but it always seems that January is guaranteed to be freezing. You know, the kind of freezing where your toes don't ever feel warm and the tip of your nose is a constant icicle. After nearly seven years in this city, I have realized that my body has finally acclimated. If I were to go back to Syracuse or Indiana, I'd struggle with the long, cold winters. 40 degrees is now the new 20 and I find myself longing for the 70s of spring more than I did other years. I've also come to realize that along with hating the cold, I hate my coats. The long, black Michael Kors pea coat that I currently have makes me feel way too professional in a conservative way and not stylish enough. And for as cute as my bright teal Columbia ski jacket looks on the slopes, I'd rather not look like a ski bunny while I'm out and about in the city. So the search has begun, mid-season of course, which always seems to make things a little more difficult. I've been looking for something slim and fitting, with some interesting details to make it a little less plain and here is what I have found so far. I've pretty much narrowed my options down to these three coats, but am having the worst time deciding. I think I like the first one the most, but I'm not a huge fan of the faux leather on the sleeves and I love the hood option on the other other two. Originally the last one was my favorite and the one I was going to go with, but then I found the other two. The second coat has a great cut to it and the breast pocket details are a plus. However, I'm not a huge fan of the black pockets. What do you guys think? 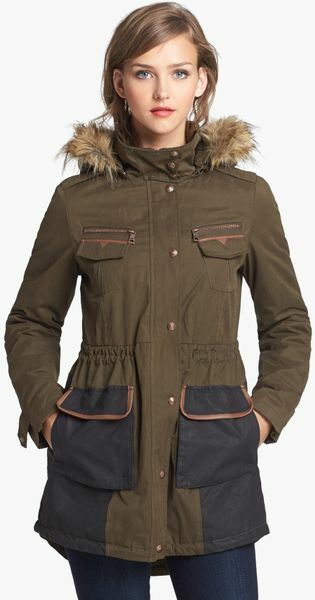 What kind of coat have you been wearing this winter season?